After transferring a final few items to and from the International Space Station, the Discovery astronauts planned to enjoy a few hours of off-duty time Sunday before bidding their station colleagues farewell, moving back aboard the orbiter, closing hatches and preparing for undocking early Monday to wrap up a busy resupply mission. "You have accomplished everything on orbit that you launched to do and then some!" flight controllers told the crew in their daily "execute package" of instructions and timeline updates. "Have fun on this added transfer day! Just a friendly reminder -- before closing the hatch tonight, make sure everything and everybody is on the correct side!" The combined crews plan to share a final joint meal before the shuttle astronauts take a break to relax and enjoy the view. A brief farewell ceremony in the Harmony module is planned for 3:33 p.m. EST (GMT-5) followed by hatch closure just before 4 p.m.
"We'll be finishing up our transfers, make sure we get everything that was slated to end up on the space station safely on the station and everything that's supposed to come back to the ground transferred over to Discovery before we close the hatches," said space station Flight Director Chris Edelen. "So the shuttle crew will be working on primarily middeck transfer and they'll take the afternoon off. They'll also check out their rendezvous tools in preparation for (the post-undocking) fly around tomorrow. The station crew will also be helping with preparing samples for return to Earth. We'll be bringing back about 250 pounds of refrigerated samples. These are mostly biological samples for life science experiments that are going to be kept nice and cold on the middeck of Discovery before she lands." Along with final equipment transfers, station commander Scott Kelly planned to remove maintenance equipment from the oxygen generation assembly in the U.S. Tranquility module after work Saturday to adjust the chemistry of supply water and to install a filter intended to prevent particulates from clogging internal components. The OGA works by using electricity to break water down into hydrogen and oxygen. The device was activated briefly Saturday after the filter was installed to collect water samples that will be returned to Earth aboard Discovery for detailed analysis. If the water meets specifications, the OGA will be returned to normal operation in the near future. 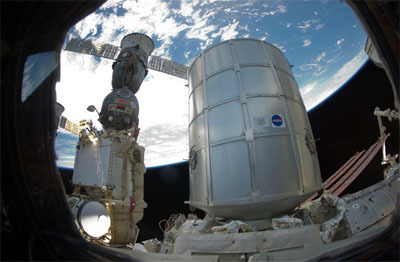 The astronauts also serviced a carbon dioxide removal assembly in the U.S. Destiny laboratory module Saturday, carrying out a bit of electronic surgery to bypass a short circuit in a heater assembly. The repair work went well and Edelen said the device appeared to be working normally.